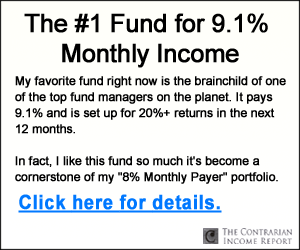 So why not just buy this fund and call it a day? I’ll give you three reasons. First, the dividend is too low. We can easily beat SDY’s 2.5% yield by being a little more selective. 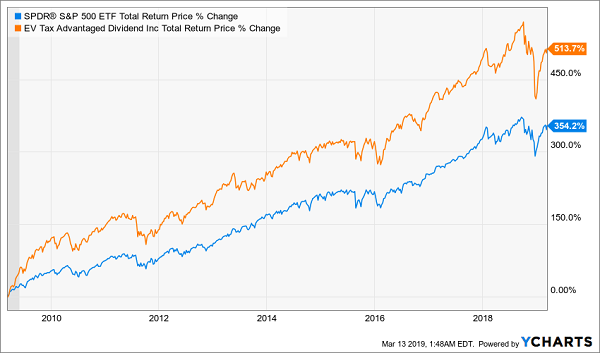 Second, SDY, which tracks the S&P 500 High-Yield Dividend Aristocrats Index (comprised of S&P 500 stocks that have raised dividends for 25 years or more), actually exposes us to many underperforming companies. Finally, the fund includes some stocks with strained payout ratios (or the percentage of earnings paid out as dividends). For many people, it’s difficult to believe that a firm that has paid growing dividends for more than two decades could suddenly cut its payout, but it happened to Bank of America (BAC) and General Electric (GE). Before 2008, you’d have been laughed out of the room for suggesting instability in a stock like GE—and then they cut in 2008 and again a decade later, in 2018. 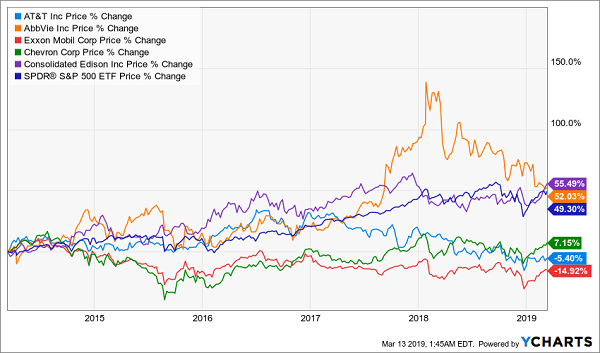 And if it happened to a one-time blue chip like GE, it can happen to any company, especially now that many of the Dividend Aristocrats in both the energy and consumer-staples sectors are facing falling revenue and/or earnings. Instead of blindly buying all the Aristocrats through SDY, we could limit ourselves to just the top five highest-yielding stocks in this group. This would give us a higher average yield (4.5%) than you’d get from SDY, but it would result in an energy-heavy portfolio that should immediately make you worried. These companies are AT&T (T), AbbVie (ABBV), ExxonMobil (XOM), Chevron (CVX) and Consolidated Edison (ED). On average, these stocks have returned 18.9% over the last four years, or 3.5% annually. 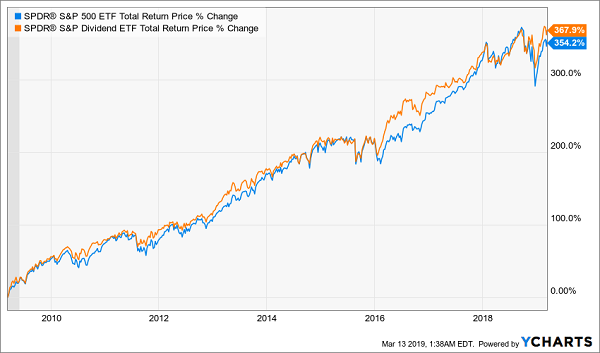 Compared to the S&P 500’s 8.3% average annual return, that’s simply a disaster. So choosing the highest-yielding Dividend Aristocrats clearly doesn’t work. What can we do instead? Its portfolio includes high-quality dividend payers like JPMorgan Chase & Co. (JPM), Johnson & Johnson (JNJ), Verizon Communications (VZ) and Merck (MRK). The fund’s dividend yield is a staggering 7.9%, and its dividend has gone up 34.9% in the last 10 years. How does EVT manage to get such performance (and income) out of big-cap S&P 500 names? Simple: it boasts a team of managers who have proven their value by conservatively employing leverage and constantly rotating the portfolio based on the payout quality of the companies EVT holds. That’s the power of going with a team of investment pros instead of a “dumb” index fund like SDY. Here’s the kicker: EVT’s management fee of 1.08% is a bargain when you look at the fund’s performance (and note here that all the returns I just showed you are net of fees). A final benefit: the fund’s tax-advantaged structure should also cut the tax burden on your profits. 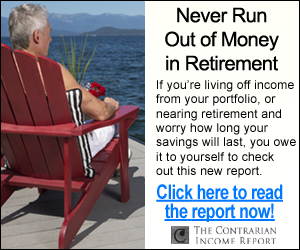 A 7.5% average payout—and that’s just the average! 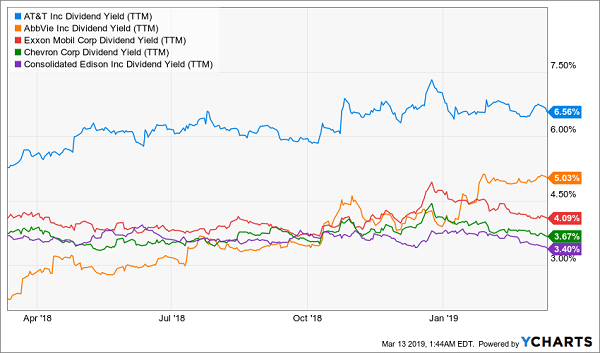 One of these dividend dynamos throws off an incredible 8.4% cash stream. Crash protection: Each of these 4 funds trades at an incredible discount to NAV, setting them up for massive outperformance on the next market rise—and cushioning the blow when the market throws its next tantrum. 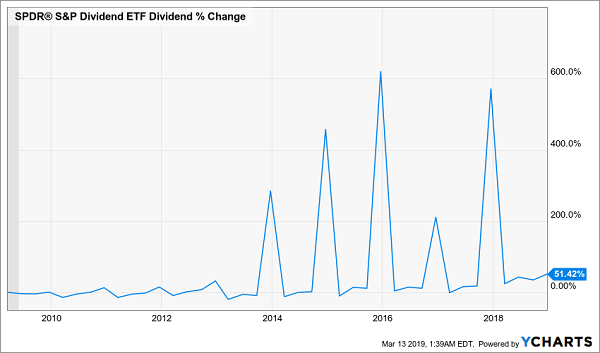 Dividend growth! The payouts on each of these 7.5%+ payers are growing like weeds. That’s right: management is practically begging us to take cash off their hands! In fact, they’re forcing us to, through their sky-yields and regular dividend growth. These are precisely the kind of investments you need to own in today’s economy. Click here now and I’ll give you everything you need to know about these 4 battle-hardened, cash-rich CEFs: names, ticker symbols, buy-under prices and my complete research, so you can kick-start your own reliable 7.5%+ income stream today.